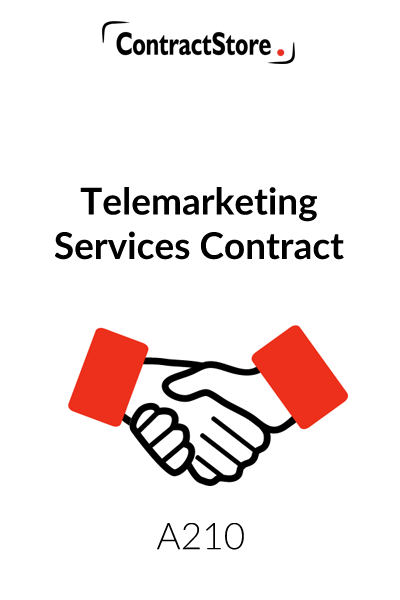 Who can use this Telemarketing Services Contract? You need this telemarketing services contract template if you are a company seeking to provide telephone marketing or telephone sales services to customers, and want to clearly detail the services to be provided. What is this Telemarketing Services Contract for? It sets out the terms on which your business will provide telemarketing services to its customers. 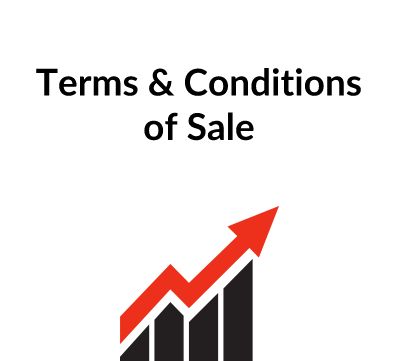 There is a short one page agreement and a set of terms and conditions in addition to a schedule that specifies the services and fees. See our document A215 if you want a contract with individuals working on a freelance basis to provide your telemarketing services. Identifying what services will be provided is always important to avoid future argument. Fees and reimbursable expenses need to be covered together with payment terms. Data protection is an area that needs to be covered in the contract. The client will provide information to the company about its target customers and both parties need to ensure compliance with data protection law. Marketing companies can suffer from clients poaching their personnel and this needs to be dealt with by a restriction in the contract. Marketing companies can not guarantee success and it is sensible to limit liability to a reasonable amount as well as excluding liability for any indirect or consequential losses. a general clause detailing notices, assignment, severability, waiver, third party rights, the scope of the agreement and governing law. ContractStore supplies templates and is not a law firm. But experienced lawyers have written all our templates, so we can arrange legal assistance for customers who need special terms in one of our documents or a bespoke template.. For more information see our Legal Services page. Contract Author – See our authors’ page. This agreement is designed for use by a company or firm supplying telemarketing services to third parties. It consists of a one page form of agreement, a set of terms and conditions and two schedules which will contain the details of services and fees etc. Please note that the agreement is intended for smaller companies and it is not suitable for the sale of financial services products. The terms and conditions are incorporated into the contract and do not require the signature of either party. It is intended that the terms are not to be subject to pre-contractual negotiation. However should this be necessary for commercial reasons, care should be taken to ensure that the revised terms are agreed by both parties before being attached to the contract. These terms are drafted from the perspective of the company. Text in italic script and/or within square brackets must be reviewed and amended before finalising the document. Briefly this identifies the contractual parties and states that the binding contract is the form of agreement together with the terms & conditions and the two schedules. The schedules set out details of the scope of the services to be provided and the company’s fees and expenses. To minimise uncertainty and reduce the risk of a dispute it is important that care is taken by both parties to describe accurately and fully, in schedule 1, the scope of the services to be provided. Where there are any other matters specific to the particular contract they should be added here as appropriate. The form of agreement specifies a “commencement date” from which the company is to provide the services and the duration of the contract (which may be extended by written agreement as provided for at clause 2.2 of the terms & conditions). This states that the services to be provided are set out in schedule 1. Additional services are to be agreed in writing along with any consequent fee adjustment. This clause specifies the date from which services are to be provided and the initial duration of the contract. The parties may agree to change the commencement date and/or the contract’s duration. The services are to be provided during the company’s specified working hours. Fees and expenses are payable by the client and are to be set out at schedule 2. Provision is made for payment of interest at the statutory rate on outstanding invoices. This is at present some 8 per cent above Bank of England base rate. In addition the company may choose to exercise its right to terminate the contract where the client fails to pay fees and expenses on time (see clause 9.1). 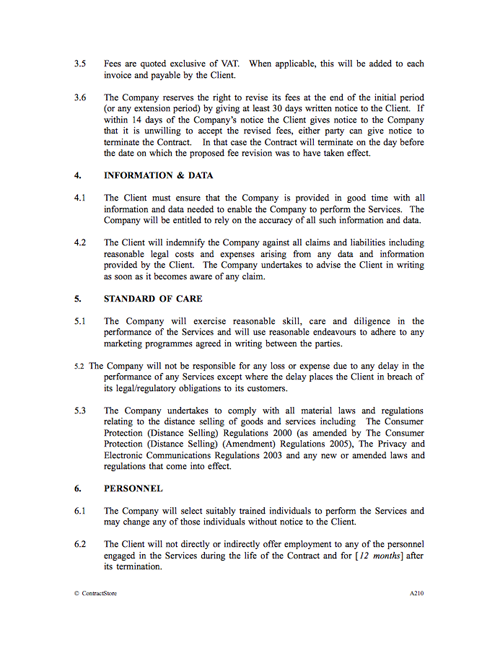 Note the provisions of clause 3.6 which sets out a mechanism allowing the company to increase its rates on 30 days notice at the end of the initial period with a corresponding right for the client to object and for the contract to be terminated if there is no agreement on a fee increase. Here the client agrees to ensure that data supplied to the company to enable it to provide the services will be accurate. The client also agrees to indemnify or recompense the company should it suffer any loss as a result of data provided by the client. This clause sets out the standard of care expected of the company and the consequences of a breach of that standard of care. Note that two separate issues are dealt with here: first breaches that have commercial consequences alone where the company is not liable for loss (but where the client may choose to terminate for breach of contract) and secondly those that put the client in breach of its legal/regulatory obligations where the company is liable to the client (the extent of that liability is dealt with at clause 8.3). It is important to appreciate that the company in providing the services will be treated by the regulators as the agent of the client and thus the client will be held liable for any regulatory breaches on the part of the company. The selling of goods and services by telephone (‘distance selling’) is subject to detailed regulations and these were changed in June 2014 with the introduction of the Consumer Contracts (Information, Cancellation and Additional Payments) Regulations 2013 which replaced the previous Distance Selling regulations. It is therefore imperative that both parties appreciate the obligations imposed by those regulations. The description of the services at schedule 1 should ensure that where relevant the company’s obligations match the corresponding regulatory provisions. You can find more information on Consumer Contracts regulations from our free download, Z171 and there is guidance on the website of the Department of Business Innovation and Skills. 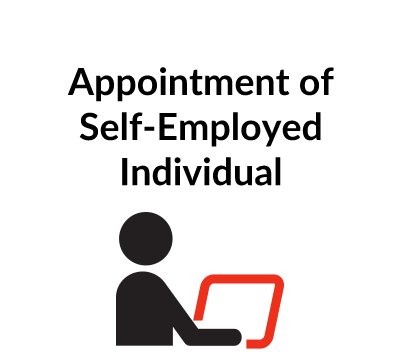 Clause 6.1 obliges the company to provide suitably qualified personnel to carry out the services. The company has to substitute individuals at will. Clause 6.2 protects the company from the risk that the client may ‘poach’ the company’s employees during the contract and for a specified time after termination. This provides that reports of marketing activity are to be provided to the client as set out in schedule 1 and that accounts relating to telephone charges and other expenses are to be provided as set out in schedule 2. Clauses 8.1 and 8.2 deal with the company’s liability for loss arising other than through a breach of legal/regulatory obligations: the company’s liability is limited to an amount equivalent to the fees payable by the client over a fixed period (we have suggested one week). Clause 8.3 is optional. It deals with liability arising from a legal/regulatory breach causing loss to the client where the company agrees to indemnify the client against all direct losses. As such losses (including fines and costs orders levied by a regulator) may be substantial and open ended it is important that this clause is not included unless adequate insurance cover is available. Also, since this insurance cover will be capped so too should the liability of the company be capped. It is prudent to discuss the details of available insurance cover with your insurance broker before deciding upon the form of clause 8. Either party may terminate the contract if the other party is in breach and fails to remedy that breach within 14 days or where the other party becomes insolvent. The company may choose to terminate the contract if the client fails to pay fees and expenses on time. Upon termination the company is entitled to payment of all accrued fees and expenses within 7 days. Where either party is prevented from carrying out its contractual obligations through external matters outside its control that party shall not be in breach of contract provided that it both notifies the other party as soon as it becomes aware of such matters and takes reasonable steps to mitigate the consequences. This clause gives both parties protection against the misuse/disclosure of confidential information. Exceptions apply where disclosure is necessary for performance of the contract, where confidential information has already been made public and where a party is obliged to make disclosure because of legal/regulatory obligations. Specifically the company agrees not to make use of the client’s customer list except when providing the services. Clause 11.2 contains an undertaking on the part of both the client and the company to abide by the provisions of the Data Protection Act 2018 relating to the processing of personal data. Breach of clause 11.2 is covered by the indemnity in favour of the client set out at clause 8.3. A number of terms standard to most commercial agreements are set out here: the arrangements for service of formal notices (e.g. notice of termination); failure to assert a contractual right does not entail an implicit agreement to forego enforcement of that right in the future; an invalid provision does not nullify the contract and is to be replaced with an enforceable provision. Both parties are prohibited from assigning their respective contractual rights/obligations to a third party without the prior written consent of the other (the company may wish to consider allowing itself an unfettered right to assign in which case we set out an alternative wording within square brackets); pre-contractual discussions are to not be binding; third parties who may be affected by the contract are expressly excluded from making a claim under the contract. The final paragraph of this clause provides that the contract is to be governed by English law and that disputes that cannot be resolved by mediation are to be determined by the English courts.